When Depeche Mode first touched down on Eastern European soil in 1985 as part of their Some Great Reward tour, there was no way of judging what reaction they’d get. The British synth band had, for the first time, been able to arrange concerts in Warsaw and Budapest – but with their records banned behind the Iron Curtain, they had no record of sales to judge their popularity. And if anybody did actually turn up to see them live, they wouldn’t even make a profit for their live performances – at the time it was illegal to take money out of Poland and Hungary. The phenomenal response they received, as illustrated in Trevor Baker’s 2009 book Dave Gahan: Depeche Mode and the Second Coming, completely staggered them. The group were unable to walk the streets in these two cities without being mobbed. In Hungary specifically, groups of fans that referred to themselves as ‘Depeches’ waited for hours for band members Dave Gahan, Martin Gore, Andy Fletcher, and Alan Wilder outside their hotel – dressed exactly like them – and then surrounded them. At the concerts, the fans sang along to every word. Against the odds, they’d managed to get their hands on copies of Depeche Mode records and had completely devoured them. It helped that the band’s style of synthesiser and drum machine-driven electronic music transferred a lot more clearly than scratchy punk guitars when it was bootlegged. Something was very clear – fandom of the band had become a subculture in its own right in the Eastern Bloc. Gabor Suller, a 38-year-old superfan originally from Tiszaújváros in Hungary and now living in Budapest, says he first heard the band’s music as a very young child in 1983. 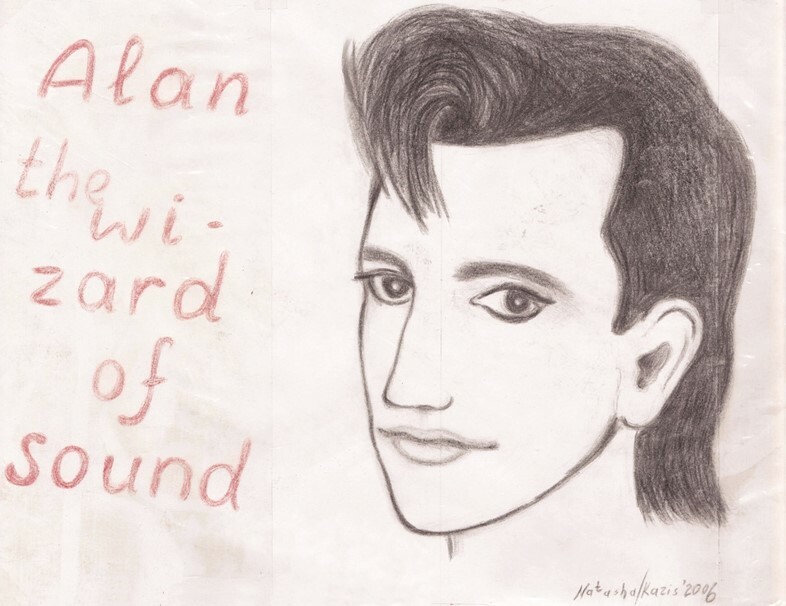 He listened to the song “Work Hard” on a bootleg tape copied by a friend of his older brother, and by his teen years he’d become a “real fan”, translating all their lyrics from English into Hungarian and travelling 150 miles each way with his friends in order to attend Depeche Mode discos put on by the country’s fan club at Petőfi Hall in Budapest – at their height, these attracted over one thousand people. Urbanovic, who has been a fan since 1986, runs the DM Bar in Riga, a nightclub completely dedicated to the band. There is another, non-affiliated and older club in Tallinn that has been visited by the band themselves. Both establishments are covered in Depeche Mode merchandise (from cardboard cutouts to tour scarves and lyrics scrawled on the walls in different languages) and both put on regular parties playing the band’s music as well as records by other ‘industrial’ bands. “Depeche Mode gigs in Latvia are very well-attended, especially when you take into account the relatively small population – and we get a lot of fans from other Eastern European countries who make a special trip to the bar,” Urbanovic adds. However, Russians appear to be the most devoted fans of Depeche Mode. This is something artist Jeremy Deller and filmmaker Nick Abrahams found when they directed their 2006 film Our Hobby is Depeche Mode, speaking to super fans from around the world, many of whom were based in Eastern Europe. “In the 1980s Depeche Mode was to Russia what Elvis was to 1950s America,” Deller remarked at the time of filming. Yuri Rybalov, a 44-year-old Russian currently living in New York, has an amazing collection of photos featuring his devoted friends in Moscow in the late 1980s and early 1990s. 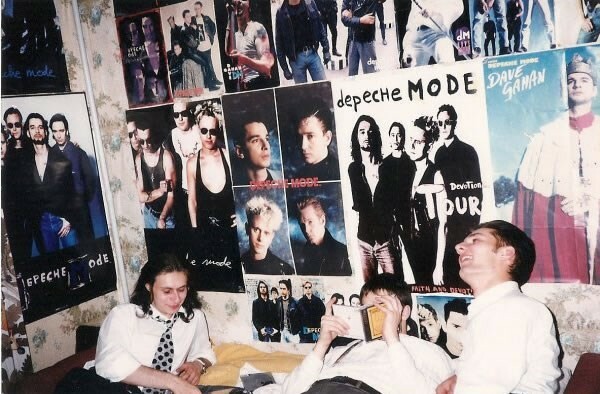 They show him performing Depeche Mode songs (“I ran parties and would get up on stage and lipsync to their music”) and sitting in a bedroom adorned with posters. Today, he remains a major fan, having seen the band “at least 38 times” in various countries around the world. Russian fans used bootleg material that they shared with their friends (it reportedly took the 1990 album Violator a year to spread across Russia), and the band themselves didn’t play the country until 1998 – a concert Rybalov missed as he’d already moved to the USA by then. The major event each year fell on May 9 – lead singer Dave Gahan’s birthday, colloquially known as ‘Dave Day’, and, conveniently Russian Victory Day, which commemorated the Soviet Union’s WW2 victory over Nazi Germany. A ready-made opportunity for people to gather together. Though these clashes may now not exist, the band remain immensely popular in the countries to this day, and they are about to hit a run of stadium dates in Eastern Europe as part of their mammoth global Spirit tour. This is something both Suller and Rybalov put down to the fact that Depeche Mode’s working class Basildon background makes them very relatable.